This is a guest post by Chris Nelder. RECENTLY, I spent eight days in the Nevada desert with 47,000-some-odd other folks at the utterly unique annual event called Burning Man. This was my third time there, and it was more than a third larger, and quite a bit more taxing, than I remembered from my last attendance in 2000. For those who haven't heard of Burning Man, it's . . . well, it's hard to describe. In fact there are probably as many descriptions as there are attendees. 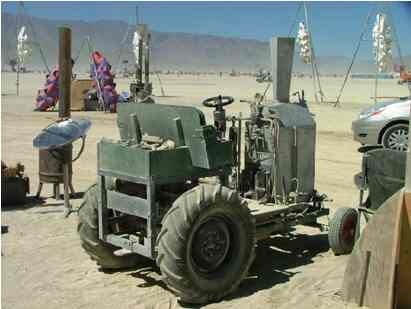 A five-mile-wide temporary town called Black Rock City is built over a period of several months on an ancient seabed, a flat expanse of alkali dust between mountain ranges. Although the event is funded by an LLC that sponsors it every year, much of the labor that goes into creating it is voluntary. To this city come many thousands of attendees: some just looking to party, some to practice "radical self-expression," some to create amazing and enormous art pieces . . . but all to experience "radical self-reliance." Because the only thing provided by the sponsors is porta-potty service. Everything else you need--water, food, shelter, energy, transportation, everything--is up to you. And that is no small feat in this place, where temperatures run well over 100 degrees nearly every day, where white-out dust storms with wind speeds over 50 mph can persist for hours at a time and destroy your shelters, and where pelting rains, even hail, can appear suddenly to turn the whole place into a deep mud pit. That's why one's de rigeur Burning Man gear must include such elements as a protective hat, fully enclosed goggles and an air respirator. For me, the answer is simple: because there's nothing else like it, anywhere, nor could there be. If you Google around and see what folks have written about the event in their blogs, and check out the videos they post to YouTube, you'll find a wide array of opinions and politics, including strident complaints from veterans that the spirit of the event has strayed far from its original roots as a small anarchic free-for-all since it began some two decades ago. There is also a good bit of criticism surrounding this year's art theme, "Green Man." And how could there not be, when you have over 47,000 people traveling hundreds (or thousands) of miles to participate in an event that prominently features burning stuff for pure entertainment? 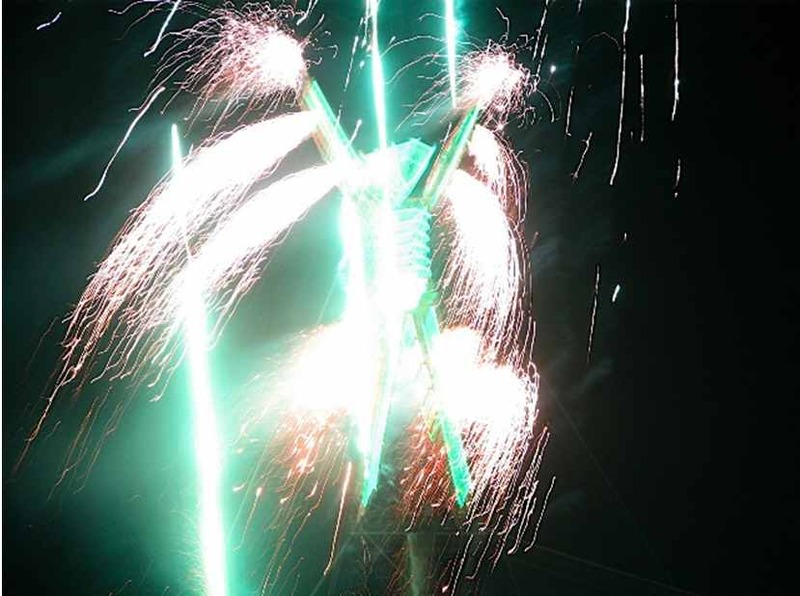 For example, the "Crude Awakening" event, which featured a 100-ft. tall wooden sculpture of an oil derrick spewing out an approximately 1000-ft tall fireball--big enough to be seen from space--complete with fireworks show, while undoubtedly a thought-provoking bit of art about oil, could hardly be called "green." According to the artists, the detonation of this piece used 2.4 gigawatts of energy, enough to "power the entire [San Francisco] Bay Area for one minute." But amid all the wanton excess and free-for-all partying that most easily captures one's attention at Burning Man, and despite the many valid criticisms and ironies of the "Green Man" theme, I found some true value in it for those of us who are concerned about the future of energy and humanity's ability to adapt to a changing world. In fact, I think it's the most optimistic thing I've ever seen or done on that score. I found steam-powered cars . . . small efficient "rocket stoves." . . . solar-powered everythings . . . a multitude of small wind turbines . 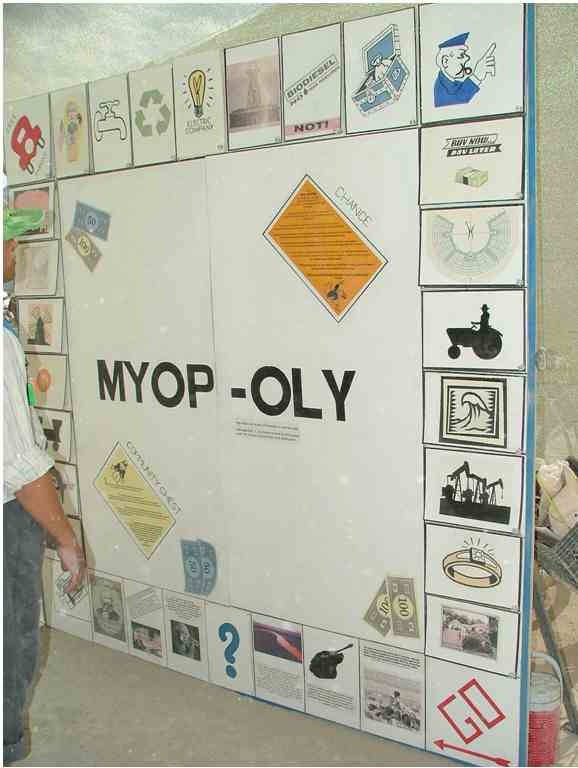 . . educational displays about energy and sustainability . . . a fully functioning "gift economy" where only coffee and ice may be purchased with money . . . where tens of thousands of people make instant community, rely upon themselves for all their basic needs, and "leave no trace," all while having a lot of fun doing it. While for many Burning Man is just a big bacchanal and an exercise in artistic "radical self expression," it's also exactly what you make it. If a party is what you're looking for, you'll find it. But I was looking for some inspiration for those of us who are concerned about the future of energy, and humanity's ability to adapt to a changing world. And I found that too. In this article, I'll mostly let the photos do the talking. Here is a small sampling of the ones I took. Below the Man, there was a pavilion featuring informational displays, kiosks, games, moderated discussions, renewable energy machines...a host of useful and educational resources where one could learn about energy, the energy aspects of the event, and options for the future. 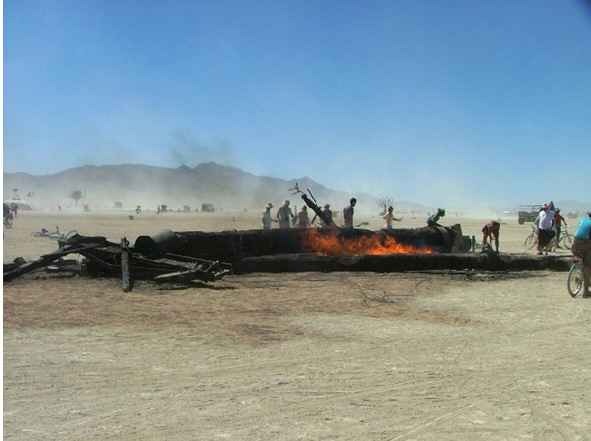 On a different note, one of the key elements of the Burning Man ethos is "Leave No Trace." Every single tiny little bit of anything that isn't playa dust or clean water is MOOP (Matter Out Of Place) and must be tracked down and captured, even MOOP as small as stray fibers of clothing and sequins. Consequently, there is a trash fence strung along the outside boundary of the event, some eight miles long (if memory serves). Only by leaving no trace can an event like Burning Man continue on these public lands (managed by the Bureau of Land Management). So every camp is exhorted to do a MOOP sweep over every single inch of their campsite before leaving. Everything that the campers don't catch, somebody else will have to clean up later when Black Rock City is finally and completely removed, leaving only the playa. This map showed the good (green) the bad (yellow) and the ugly (red) sectors from the previous year. There was even a little "Eco-confessional" booth where you could step in and confess your ecological crimes to a person on the other side of the veil. 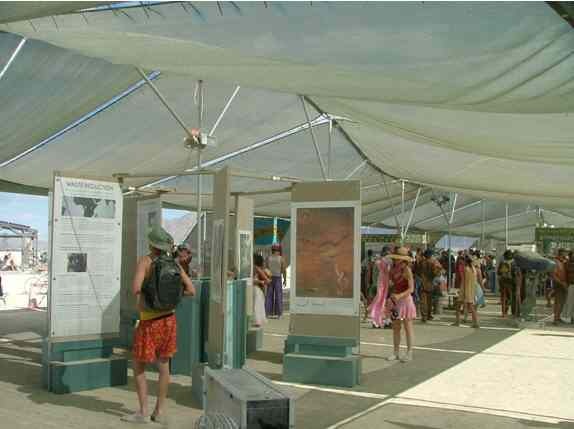 But for a longer-term impact, Burning Man also sponsored the design and installation of a 120 kW solar array in Gerlach, Nevada and a 60 kW solar array in Lovelock, Nevada, which will remain year-round as a donation to the nearby communities. Among the more interesting installations in the pavilion under the Man was a unique little wind turbine, just 200 lbs and 6.5 feet tall, on a pedestal which was designed for mounting to the parapet of a flat roof, so that it wouldn't require any roof penetrations. This cute little bugger purports to start up with only a 7 mph wind (12 mph is more the usual requirement) and claims to produce 55 kWh/month (but they didn't specify how many hours of wind that was based on). 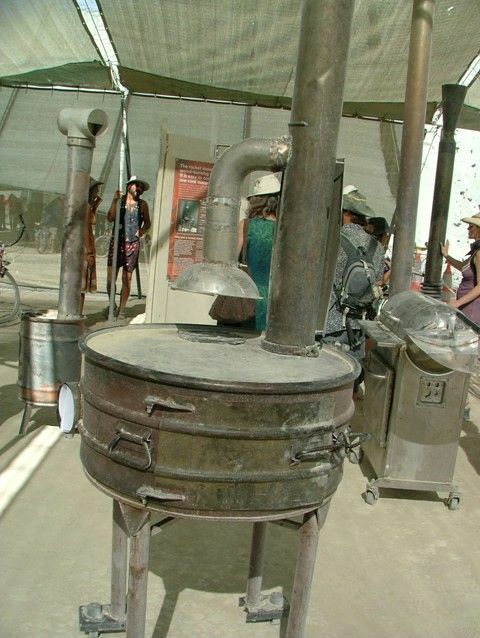 There was another display, featuring several designs of "rocket stoves." These are essentially simple wood-burning stoves, which restrict air flow so that they burn hotter and more efficiently, with fewer emissions. Such stoves can provide space heating, water heating, and a cooking surface all in one. Since they can be made from everyday items and scrap metal, they are particularly useful for third-world applications where wood is the only available fuel but is typically burned in inefficient open pits. Apart from the central pavilion, there were also many purely fun applications of renewable energy, such as this zoetrope installation, which when lit up by strobe lights at night, gave the appearance of apes crawling around the top ring as green snakes wound their way down the armatures to feed them an apple. The box in the back contains wood, which is fed into a small firebox at the driver's feet. 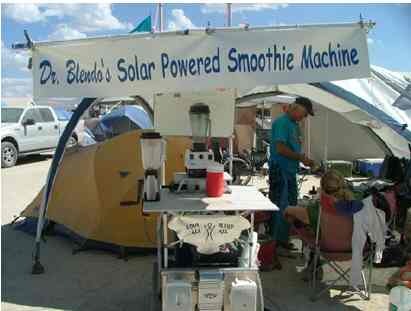 Another fun solar application was "Dr. Blendo's Solar Powered Smoothie Machine": a DIY project built on a little cart, with an electric and a hand-powered blender, a canopy of thin-film solar, a Xantrex "Power 1500" integrated battery/inverter unit in the bottom, a Bose sound system, and a cooler. 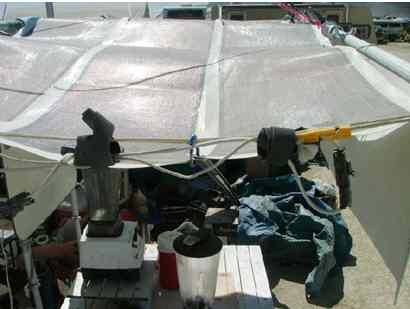 According to Dr. Blendo, the blender overheated and gave out long before the solar power system did. He was using it to charge up all matter of batteries since it was generating extra power. Among the theme camps at the event was a designated Alternative Energy Zone, featuring some 50+ participants who offered a guided tour of their various alternative energy devices, even handing out cookies baked in a solar oven. Unfortunately, I was unable to attend a tour, but I stopped by and found a camp full of enthusiastic folks, including everyone from garage tinkerers to electrical engineers, who had brought their functional projects to display and discuss. I found it quite inspirational. 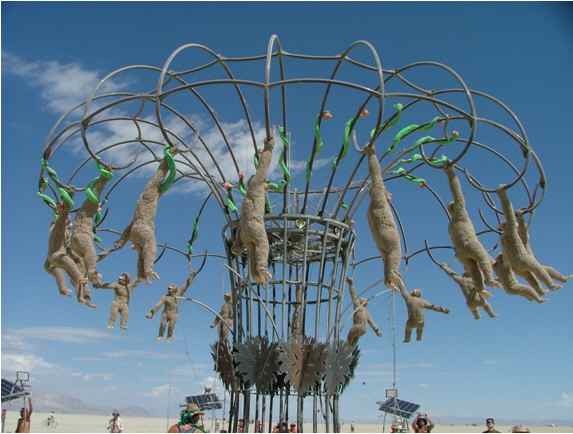 Of course, this is but a tiny little representation of the inspired madness that is Burning Man. Even a week is a paltry amount of time to devote to discovering the many experiences that the event has to offer. And one person's experiences can only hope to offer a small representation of what was there. 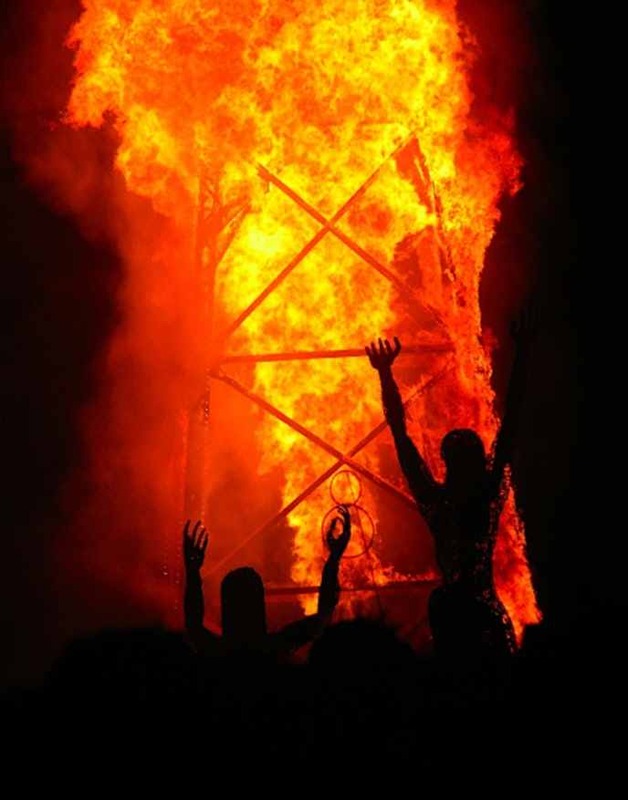 So why would I see fit to write about Burning Man? Because I found in it real inspiration for our future. Sure, it's a big party, and the "Green Man" theme is chock full of ironies. But it's also a testament to the fact that 47,000-some-odd people can not only survive in extremely difficult conditions, but thrive, without money, without facilities, without a grid, without a grand plan to pull it all together, and without leaving a trace. It's simply human ingenuity at work. 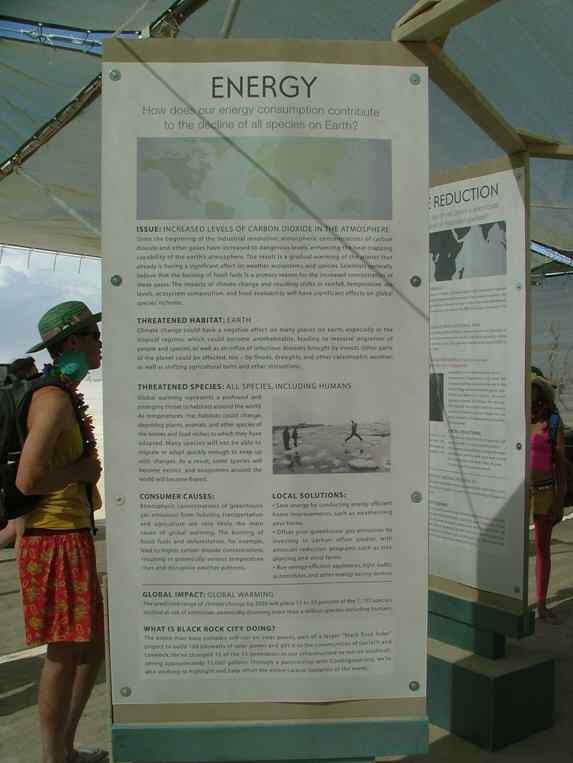 With a strong ethos of instant community, Burning Man proves that people can come up with their own bottom-up solutions to energy, water, food...all that a person needs. And that gives me hope. Yes, peak oil presents some very difficult challenges to a public accustomed to being able to fill up a gas tank or turn on a faucet at will. But if we work together, and take a cooperative attitude toward those challenges, we can face them together and still have a great time. Everything we need is in our own hands. We just need to realize it. Thanks for the look see, I have seen them on the net before, and did wonder if anything was worth that kind of time and weather conditions. Not that I have the means to get out there any time in the future. So they were able to clean up the burnt wood piles and all? That must have taken a bit of effort. We have come a long way from Baker Beach. The Oil Drum and Peak Oil thoughts are getting to the head shed. 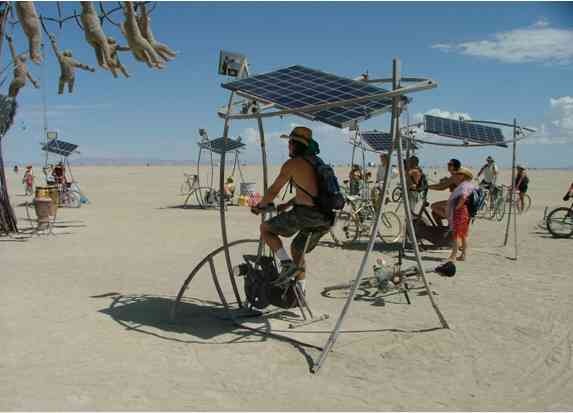 Burning Man represents everything wrong about the attitude of the United States toward energy and effluent. Energy as the consumption of petroleum to obtain the event incrementally shortens the time period before effective oil peak arrives. 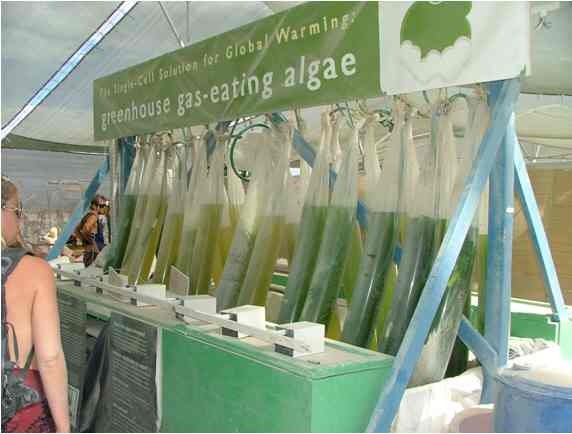 Effluent because the event maintains status quo -- if indeed it is "carbon neutral" -- when the overarching need is to reduce the emission of carbon and other climate change gases. 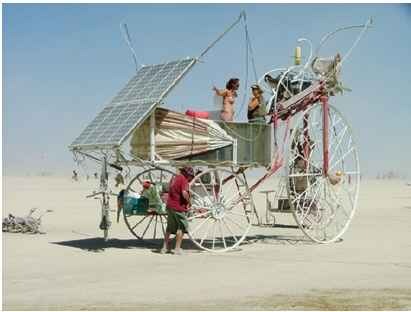 In time Burning Man will burn out because petroleum depletion and climate change will loom too large for ignorance. The willing are invited to www.realclimate.org to better understand the magnitude of accelerating rates and effects of climate change phenomenon. Wonk-itty wonk wonk! Who peed in your Cheerios? Yes, energy depletion is a serious issue, but people gotta live, man. Burning Man is a celebration of originality and the human spirit of creativity. SOMEBODY was going to burn up all that oil. At least its being used for a worthwhile event. As much as a peak oiler may like to believe it, life's ultimate goal is not finding the "wisest" use of our natural resources. 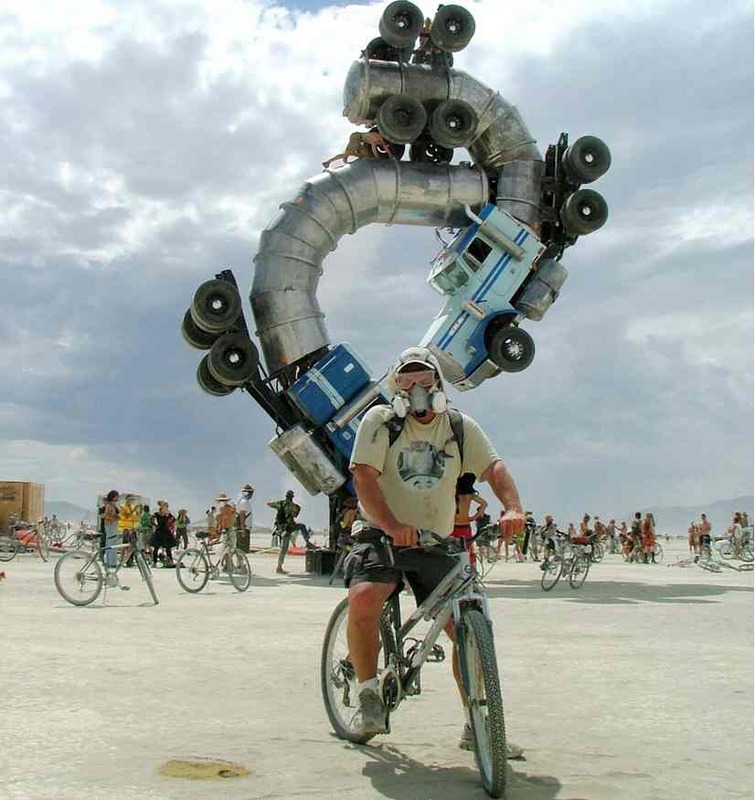 Your attitude, though technically correct, fails to acknowledge the deep mystery that supports and fills our existence--mystery that Burning Man explores and creates. You really should go to BM before you judge it. It's like living on another planet. And the attitude change that it can bring about may in fact be worth all the fossil fuels that were "wasted" to make it happen. But Burning Man isn't an "attitude change". 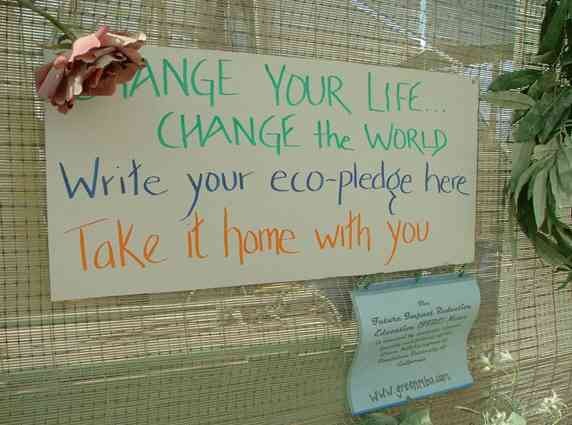 It's not about living sustainably in the desert or anyplace else. People driving RVs to the place and then spending six weeks or whatever... it's a festival of "we've got oil, we'll burn oil, and if you have the oil we require, we'll send troops in to take the oil, and if you don't like that, we'll kill you and your kids, too." 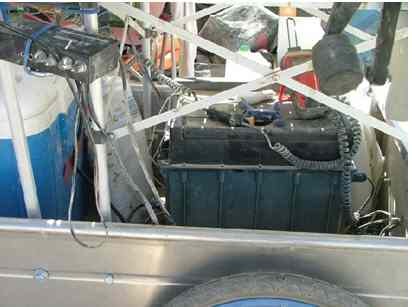 RVs use the same amount of fuel as an APC. Alternative? No way. It's the children of the upper middle class consuming just as their parents do, only the clothing and appearances are different. Worthwhile event? I don't see how. The original Baker Beach Burning Man has been 20 years, and this has turned into Disneyland. "SOMEBODY was going to burn up all that oil. At least its being used for a worthwhile event." 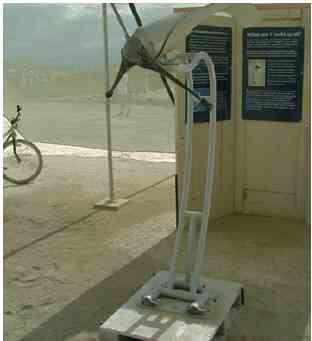 And that is what is wrong with Burning Man. "The sun and the moon and the stars would have disappeared long ago ... had they happened to be within the reach of predatory human hands." They can only survive there for a few days because they bring almost everything in using oil based transport. They also bring their healthy well nourished bodies, fed by our oil based food system and cared for by our oil based health care system. They pay for it all with their many and various jobs in our grand oil based economy. More power to them. Enjoy the good times for they are indeed very good, and their bodies have the strength to withstand heat, dust and mild deprivation and not worry very much about it at all. But a real alternative gathering that understood the post oil future would be located in a rain irrigated area and would be teaching and celebrating agriculture, harvest festivals, permaculture, and the technologies of human survival at lower levels of energy use. Burning Man is a big fun festival, perfectly suited for the periphery of the oil age, in the last moments before everything changes. It should be enjoyed as a celebration of what will soon be the good old days ... but it is hard to see how it is relevant to the future. The Burners used to hold the festivities on deserted beaches in California within striking distance of SF but the law organized against them. In the whole of Amerika this place, a dead, unforgiving environment was an area where they COULD get permission to do their thing. 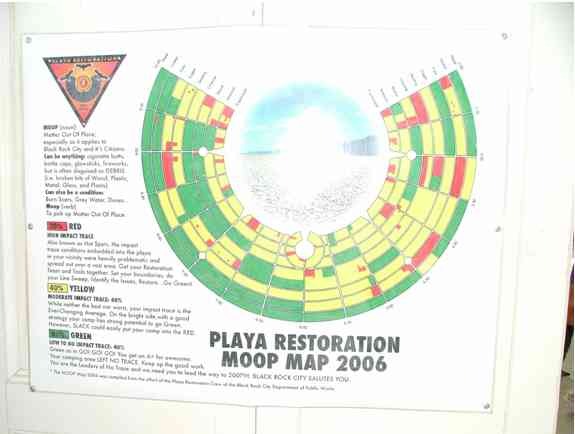 The choice of the playa is a choice of last resort in the land of the free. Mad Max has arrived. Brilliant. And the Burning Man. Am I the only one who is reckognizing the giant Wicker Man? This is perfect Techno-Punk science fiction with a twist: the scenario is the desert, yellow, dusty and shiny sun. Re: wicker man. You mean they burn people alive in the thing?? While it's nice that there is an effort at environmental awareness here, there remains a massive shall we say cognitive dissonance at work here. I'm glad they can play in the desert, kudos to them for cleaning up so thoroughly, just don't call it "green". Do the similarities to easter island match. Thank you for posting about the Burning Man! It sounds like it was great fun, and a real celebration of creativity. I'm just sorry that at 55 I'm too old to spend a month or two out there. Its amazing to me how many people feel free to criticise an event like Burning Man. The hydrocarbons that are used there are certainly a better use than idyling cars in a freeway traffic jam or keeping the lights on all night in an empty parking lot, stuff that the critics seem perfectly willing to accept. At least the Burning Man gave people joy and helped them bond, becoming a tribe working on the changes we all see coming. It gives me hope that humanity will muddle through once again and meet the challenges of peak oil and climate change. You said it, Bob! Thanks for sparing me the trouble. What Burning Man is is a special opportunity to make something, try something, be something, that one has never done or tried or been before. With its strong "No spectators, only participants" ethos, it's an invitation to be creative, entertaining, and self-sustaining--and that's something I can't say about any other event. I have always come away from it full of inspiration and new ideas and new friends. There are some truly remarkable humans there, concentrated in far greater density than you can find just about anywhere else, from all over the world. It's about as far from a Rainbow Gathering as you can get (hippies are openly mocked at Burning Man), but I would hardly call that a failing; I've never heard of anybody suffering from dysentery at Burning Man, for example, and people generally try to stay clean and hydrated and healthy. And if we must use Rainbow Gatherings as a model (I certainly wouldn't), then let's have them all arrive on foot or horseback before we laud their example. 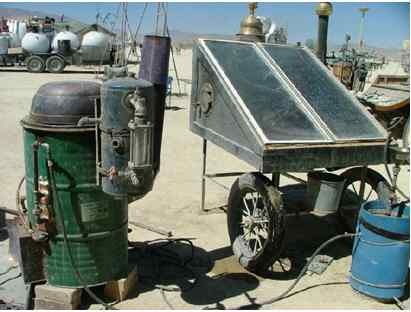 Now, if Burning Man had set out to be a model of sustainability, or of the wise use of fuels, then I would be first to criticize its use of them. But it isn't. It's just an event. Shall we cancel all festivals and gatherings of all kinds just because they use fuel? Come on, people, get over yourselves: this is a once-yearly event, a drop in the proverbial bucket, and the benefits to society, IMHO, far outweigh the costs. If you want to tackle a useless waste of fuel, try NASCAR or PGA. And how about at least a tip of the hat to their permanent 180 kW solar gift to the nearby communities? I'd like to see other events at least attempt to make a similar contribution. With the resulting thin and shallow character it has come a long way from it's anarchist roots at Baker Beach. At Baker Beach they did. It is better than hanging out at the Mall. hightrekker - No doubt it's a very different event now than it was 20 years ago. I noticed some very prominent differences between this year and the last one I attended in 2000. But isn't that just how the world works? Can you name any event that is today just like it was 20 years ago? And I have a limited patience with those who moan that it ain't like it used to be. 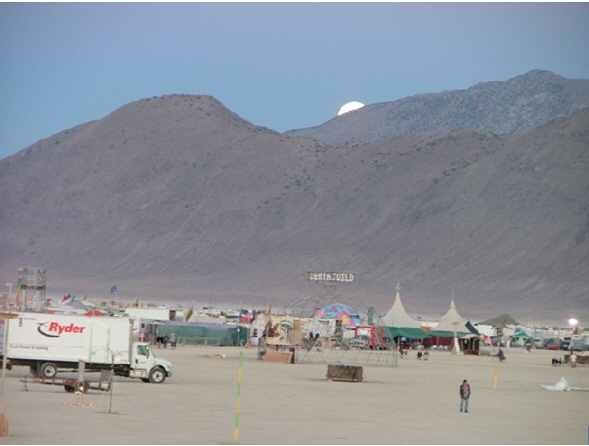 (And this year, the line of signs stretching between the highway and BRC mocked that sentiment most hilariously.) Many of them have stopped going to Burning Man at all. So, they're not going to participate, but they're going to complain about how others participate? That fails to move me. Ninety percent of life is just showing up--Burning Man is no exception. I agree, show up. In this bland global culture of sameness and cultural pabulum, what have we to lose? But, let's be honest, we are playing in the shallow end of the pool. At least it is better than listening to techno at one of those clubs that could be in Bangkok or Orange County, you would never know the difference, unless you asked. Great! I have been listing to mostly singer-songwriter things lately. Techno has it's place, to to me it reinforces the cultural blandness of this collapsing planet. Of course, I better not say that on MySpace. Bob, P.S. : At 55, you're not too old to go to Burning Man. One of the guys in our camp was 61, and I believe this was his 15th Burning Man. I found plenty of gray-haired codgers out there! In fact, they're often the leaders of the larger and more interesting theme camps, demonstrating the benefit of their experience! Thanks, guy, I'm sure going to think about it for next year. As an old hippy, we got the movement coopted by the pious environmentalist types. That's what's wrong with Rainbow Gathering-too damn many puritans who think they're liberated because they don't wear underware and now mistake sand candles for art. With the $350. plus expenses entry and the RV factor, I do think the Surburban Man comment above is most appropriate. 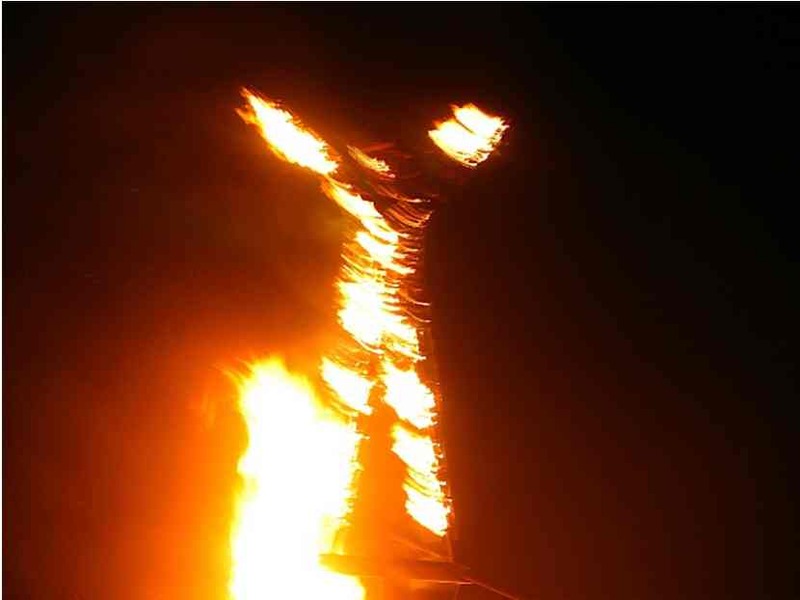 The technopaganism of burning Wicker Man is getting pretty religious. It would be interesting to study the contrasts with Rainbow Gathering events...maybe fire and earth would be a start. 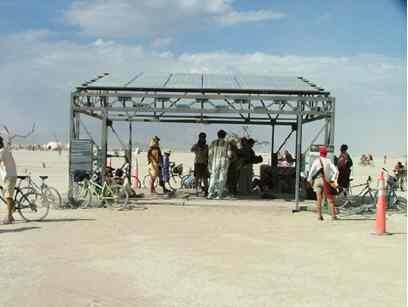 I suspect the Rainbow gatherings will keep occuring long after Burning Man has burnt out. so who cleans up that 8-mile long "trash fence"? 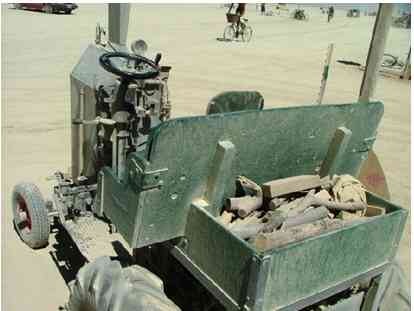 The Burning Man DPW--the same folks who erected it. Check their Web site for more info. Um, but what about the trillions of BTU's of embodied energy provided by a vast fossil fueled industrial infrastructure...? Sorry Chris, it sounds like a fun party, and if you had left it at that you would have been fine, but I'm afraid I must throw my vote in with the party-poopers. Extrapolating all that extravagance into some sort of cause for eco-evangelism is way, WAY over the top. 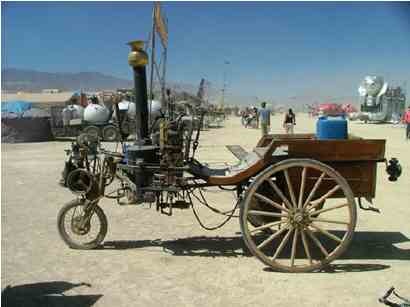 I mean c'mon, wood powered steam cars? I didn't see a whole lot of trees out there on "the playa". You're right. It would have been much better if no one had made any attempt at anything green or post-oil energy related whatsoever. Perhaps you would have liked it better if I had not tried to share the things that inspired me? Or maybe you were offended by the "Green Man" art theme, and would be happier if the event did all that it did, but kept very quiet about it? In any case, I don't get these objections. At all. Surely I don't have to explain AGAIN that "Green Man" was merely this year's art theme, and not a promise, testament, warrant, model, ideal, paragon, or forward-looking statement? And what will the next Burning Man be burning? Eh?, Man? I am sorry if you don't get what the complaints have been about, why not go out to the desert alone under the stars and do a bit of thinking about it. As far as popularizing this event, I wouldn't bother, likely the future has more exiting things in store, for all of us. Mercy me and here I always felt the 'All American Food fight' was over the top. Suburban Man and reality are dialectically opposed. Most suburban men would be frightened to be alone in the desert. Don't expect much. No I think it is because once in a long while they are right, but then it is likely to be about something disquieting to really look at and, IMO, that is what makes for peevishness.. Check my record on TOD ... mostly wrong! BTW, a long time friend told me about going to Quartzite Calif for a vacation and to trade rocks or gems or polished stones, something. He ran into a bunch of guys who took him out to the desert where they shot off great masses of ammunition, everything from handguns to machine guns. He had the time of his life. I guess you would call my friend a red neck, who there in the desert had met a bunch of soul mates he could really relate to. Maybe this and the burning man are two similar experiences, but one difference is that after we had become, friends about 20 years ago, the terms hippie and redneck have lost any significance. Incidentally I met him while fishing about 30 years ago. Inauspiciously to say the least. Much like this meeting with Chris. Nor was my intent to "popularize" (or for that matter, defend!) this enormous event, which is so much bigger than me, or my perceptions of it. It was merely my intent to share some inspiration I found in it. But, like many of my other articles, this innocent ambition has drawn a lot of snide, even ignorant, criticism on TOD. What can I say about that? I think it speaks more of them than it does of me. You have no idea how much of a hippie I may or may not be, how I might feel about the fact that they're openly mocked there, or how many nights I have pondered many things under the desert stars alone (I grew up in the Arizona desert). Nor, I imagine, do you care. It's just another ad hominem attack. You don't know the first thing about me. And to answer your other question--which I reckon you don't really care about either, but what the heck since I'm here--next year's theme is "The American Dream." Of course patriotism was never one of my strong points. I do like to dream though- but never of nationalism. But still attached to outcome. Boy you sure can type faster than me, last I looked I had a clear road ahead, now there you stand looking at me and mad I guess as hell. Looks like it will take 10 years but I hope not as you are probably a fine upstanding 'whatever'... you don't really say. First lets get that theme out of the way. I would say that a whole lot of the world inside and outside the USA has really had enough of the "American dream", that along with it "not being negotiable". I apologize for coming on so strong, I have been have been by a couple times to take a look see and not making any comment. I would not have said anything if all you had done was report that (hippies are openly mocked at Burning Man) but you added but I would hardly call that a failing That I considered a type of discrimination worthy of comment. I am sorry you consider it an ad hominum attack. If my comment was ad hominum I think you crossed that line well in advance of me. et tu hightrekker...gee I am slow! Yes, Burning Man is a glorious petro-fueled celebration of free expression in the middle of the desert that would not be possible in its present form without petroleum. 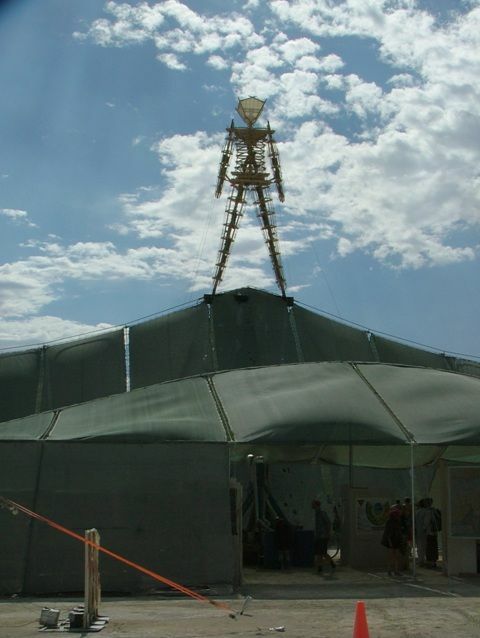 The Green Burning Man is a mirror of our larger late capitalist society, burning through resources untill the Party's Over (to quote Heinberg's book title) yet staring it in the face and making piecemeal changes in the hopes that this will ease the transition when the unknown but inevitable actually hits. Sure, the irony of the Green Man theme is a bit myopic itself. They should bring all the solar panels and wind generators and alt-energy DIY project discussions anyway; no need for it to be the theme of a non-green party to begin with. 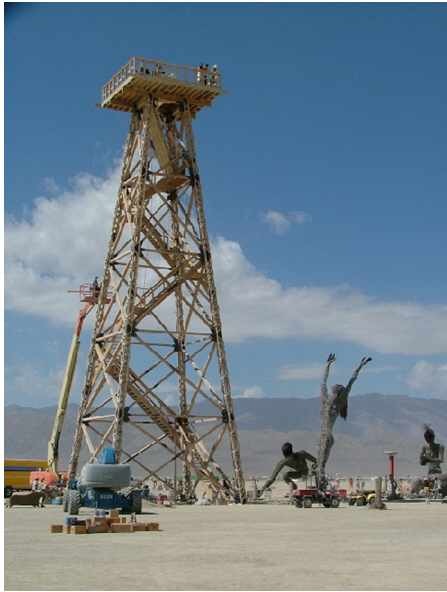 That said, Burning Man should be no more condemned for depending on oil than anything else that does. It's a great party and allows people to connect and freely express themselves in ways that the cacophony of modern civilization makes possible. Ways and connections that may positively resonate with us long after the great oil fields are in the EROEI red. Tips of a butterfly's wings.